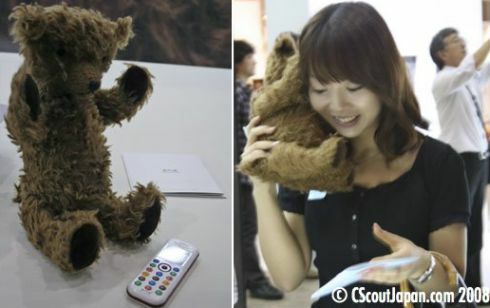 The 2008 Good Design Expo was the perfect time to introduce a teddybear phone to the public… Say what? Exactly, Willcom has gone where no one ever dared before and showed the public the Kuma Phone, a stuffed toy with the features of a cellphone. It can bear (get it?) a SIM card and you’ll have to hold it to your ear in order to hear the person you’re calling. Kuma Phone allows you to store four speed dial numbers in its memory, each one associated with a paw of the teddy that uses internal pinching sensors. Add custom sounds for ringtones, vibrations and the chance of answering/hanging up by pressing the tail and you’ve got a $500 package on your hands. Expensive? Very, but you might need to save that cash in case a Kung Fu Panda phone shows up.